The scan cycle of the PLC, what is the scan cycle of the PLC? When the PLC is in the RUN mode, the time required to perform a scan operation is called the scan period, and its typical value is about 1 to 100 ms. 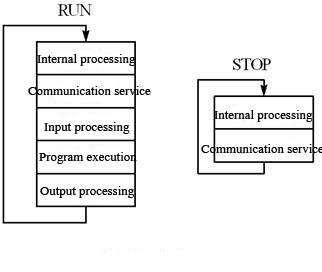 The plc scan cycle has a lot to do with the length of the user program, the type of instructions, and the speed at which the CPU executes the instructions. When the user program is long, the instruction execution time accounts for a considerable proportion of the scan cycle. Some programming software or programmers can provide the current value of the scan cycle, and some can also provide the maximum and minimum scan cycles. This entry was posted in plc program and tagged importance of scan time in plc, plc operating cycle, plc scan cycle, plc scan cycle diagram, plc scan cycle explained, plc scan rate, plc scan sequence, siemens plc scan cycle on October 8, 2018 by arco.